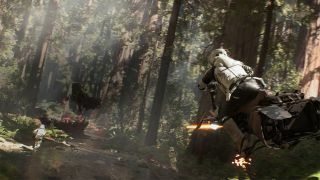 Vehicles will play a big role in Star Wars Battlefront: X-Wings, TIEs, "hero vehicles," and yes, the speeder bikes that were so appallingly hazardous to their operators' health in Return of the Jedi. And as GamesRadar's video of speeder bike gameplay so vividly demonstrates, they remain just as they were in the film: Fast, nimble, and just as dangerous to the guy sitting on it as it is to whoever he's chasing. "But wait!" I hear you say. "Star Wars Battlefront isn't out for almost a week!" That is true, and it's why you're not seeing reviews popping up anywhere just yet. It's available right now, however, to members of EA Access, an early access program that's unfortunately exclusive to the Xbox One. That's why GamesRadar has the footage, and I'm swiping it. Back to the matter at hand, it's clear that speeder bikes aren't something you're meant to spend very much time on. They appear not entirely unforgiving, as the speeder in this video seems to bounce off at least one tree without any apparent damage midway through the chase, but the wheels come off—figuratively speaking—not too long after. Too fast, too fragile. And now he's gone—but you'll never forget him. Star Wars Battlefront comes out on November 17.